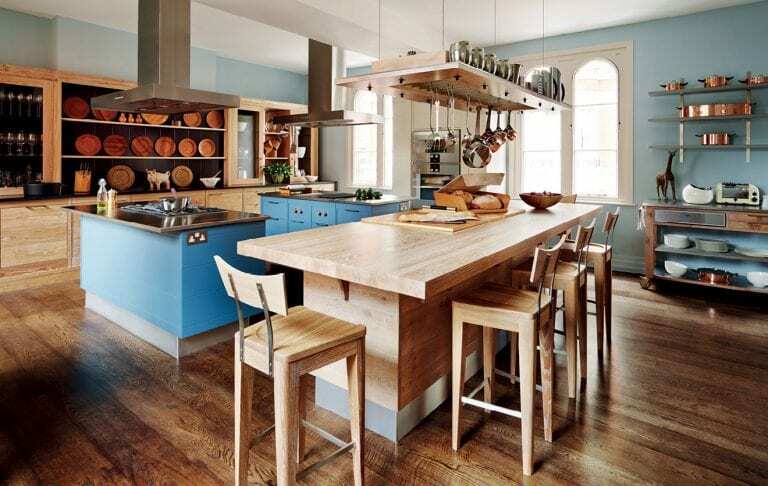 Looking at the stunning oak kitchen cabinets reminds me that design is not dead and wonderful ideas are still being created such as these and the island fashioned by Smallbone of Devizes. Take a look at the great grain of the wood which is so evident on the island counter. This is the Brasserie line whose inspiration was deliberate in using slats of oak and fashioning them together. It’s not a bowling alley by any shape of the imagination, but you get the idea. This unique grain was chosen due to its expression of knots and other imperfections which in truth are character as if the wood is telling its own story to a crowd. I thoroughly enjoy visiting Brasseries in Paris and you can see how that inspired the use of wood and then pots and utensils hanging up. To me the most intriguing element is the amount of seating and how the whole space fits together. A person could almost be “tending bar” if you look at the configuration. The amount of seating is spaced out and very comfortable and yet remains in the center of the action. The experience and mood is just like you might imagine sitting down for a cup of coffee in the morning at a bar and watching people come in and out to get their beverages. There was so much thought in the entire layout of space as you can see in the picture above. It’s a great functional space that can be used for many things. Notice how great the grain is on the island. The oak kitchen cabinets are wonderfully constructed and arranged to accomplish storage and showcasing decorative items. I found that this angle really shows just how large the seating and kitchen island are. This setup could easily replace a dining area if that were the choice of a home owner. I too love how the family could gather around and perform any activity such as conversation, homework, computing or cooking and remain together as one unit. You can see the copper pots and pans which draws back to the amazing coffee machines found in Brasseries. It does require some polishing to keep the metal this bright, but you can see how great the results are if you do. The grain on the cabinetry is just spectacular! There are so many swirls and striations that make nearly every drawer unique. Smallbone of Devizes can also paint these in any color if that is preferred by the home owner. Custom paint design is also available if you really want to make a different statement. The black counter top goes very well and adds a bit of darker hue to the overall feel of the product. I like being able to see the storage since I want to know how useful that may or may not be to me. Think about your own cooking style and where you like to have things handy so you can know if this is a good solution for your needs. Some people many not like the color here and metal tops, but I think it adds a lot to the overall design. Mixing metal together with wood seems so unusual, but look how great it works here. I can say that if the whole room were wood it may appear too muted out and not have enough contrast. Also, the colors you can add here can go from neutral to contemporary creating an effect that fits your personal decorating tastes.